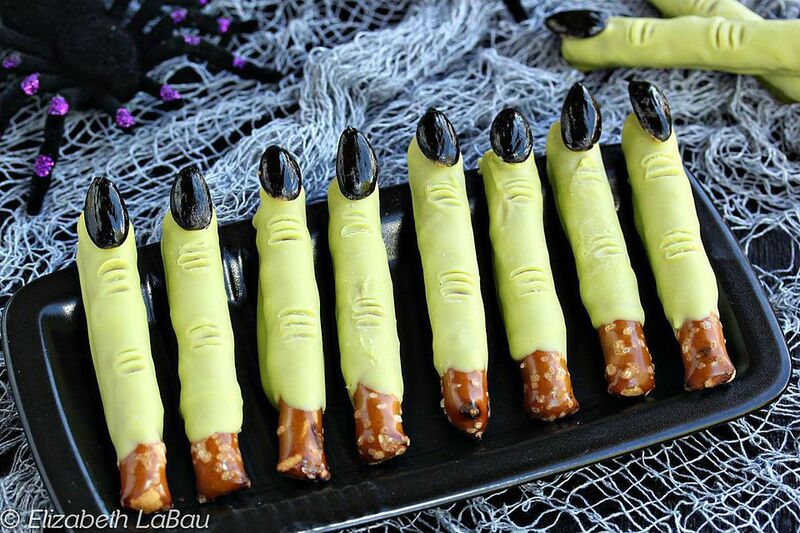 Witch finger pretzel rods are one spectacularly spooky sweet-and-salty treat for Halloween or any wizard-themed party. It takes just four ingredients to make this ghoulish recipe and it's simple enough for kids to lend a hand (or at least a finger). They are a hit with everyone—from the smallest goblin to Dumbledore himself—and will be gobbled up quicker than you can say wingardium leviosa! Set aside on waxed paper or parchment paper to dry while you prepare the rest of the recipe. Place the green candy coating in a small but deep microwave-safe bowl (or heatproof cup) and microwave in 30-second increments, stirring after every 30 seconds to prevent overheating and burning. Stir and heat until the candy coating is completely melted and smooth. Continue to dip more pretzels and, while you do, keep an eye on the already-dipped pretzels. When the coating has started to dry and is mostly matte but not completely hard, it's time to add the wrinkles for the knuckles. Take a toothpick and hold it perpendicular to the pretzels. Gently roll it across the top to add wrinkles. Make two sets—one set near the fingernail, and one set about halfway down the finger. This will make your witch finger super realistic-looking. If the coating is too melted and sticky when you try, give it a few more minutes to set before trying again. After all the pretzels have been dipped and decorated, refrigerate the tray for 10 minutes to set the coating completely. After that, the witch fingers can be served on a party tray or be standing up in a mason jar. If you can't find blanched almonds, take whole, skin-on almonds and place them in a pan of boiling water for 1 minute. Drain the almonds, let them cool slightly, then pinch the nuts between your fingers—the skins should slip right off. Witches fingers can be stored in an airtight container at room temperature for up to one month. If you don't want to use almonds painted with food coloring, substituting chocolate-dipped almonds or uncoated almonds is an easy and delicious swap. And if nuts are an issue, instead of almonds, make the nails out of candy corn dipped in chocolate or painted with black gel food coloring, or use black licorice cut to shape and stick them on with a dab of melted candy coating.